As a member of Healing Touch Buddies in FL, I received this image to share...and it really promted further thought on this matter. We all know this in our minds, but for someone who's just received a cancer diagnosis, it is a critical reminder. Remember, I've been there...the shock catches your breath and not just for a moment, but for hours, days and even weeks for some. From the book of Genesis, we know that when God created man, He breathed life into him, giving us our soul, our essence. And just as He did with Adam, He does with every living human born since. It is this breath that makes us unique and hosts the physical life being for an eternal soul. It is the God-given physiological connection to our mind, heart and soul. Focusing on our breath allows for us to "ground" ourselves, which can be a little different for everyone. For me, "grounding" means that I am tuning out the noise of the world around me and shift my focus inward and upward (towards God). When we sit, even just for a minute, close our eyes and listen to our breath, things change as this grounding begins. Our thoughts change, our physical body shifts, our heartbeat steadies, our nerves calm. We may or may not begin to see things a little clearer just yet, but we do begin to see more, feel more, hear more. At first, thoughts and feelings of fear may quickly enter the mind, but with time, those too will begin to shift and relieve. This is the foundation of all energy work and can be practiced alone or with the assistance of a healing facilitator through healing touch. Physically, as our hearts steady, our bodies are then given permission to relax and become calm. This then allows for the adrenals begin to relax, which is physically critical for the healing process to begin. When one receives traumatic news and is told to "fight the cancer" by the well-meaning family, friends and doctors, the adrenals take those messages and go into that fight or flight mode. This is incredibly taxing on the body and immune system which are needed to eliminate the cancer. But when we allow our body to relax and those adrenals as well, we then give them a break, putting our bodies into rest and recovery mode. Just like when you have the flu and you need to rest and recover while your body alternates the fighting off the virus with a fever. Physical healing requires both! Fight or flight first immediately followed by rest and recovery. But unfortunately, the "fight" mentality takes over for those facing cancer, therefore, their bodies can never benefit from the rest and recovery periods. This leads to a whole host of issues as the immune system them becomes severely compromised and the person is unable to ward off treatment side effects in addition to environmental daily hazards, not to mention do it's part in eliminating the cancer. I know, this sounds silly - we all breathe without thinking about it. But to fully benefit from conscious breath, there are a few techniquest that can be practiced. And, I say practice because it does take time to get used to breathing deeply and take full advantage of the opportunity to ground oneself. There is a yoga breathing practice that utilizes alternating nostrils to create optimum airflow (my favorite). There is also the practice of breathing in slowly for 5 seconds, hold for 5 seconds and then release for 5 seconds. Multiple deep breathing exercises can be found on youtube to find one that suits you best. Once you get used to the physical action, it's a great foundation for prayer and meditation and before you realize it, you will be incorporating these practices into multiple activities throughout your day. 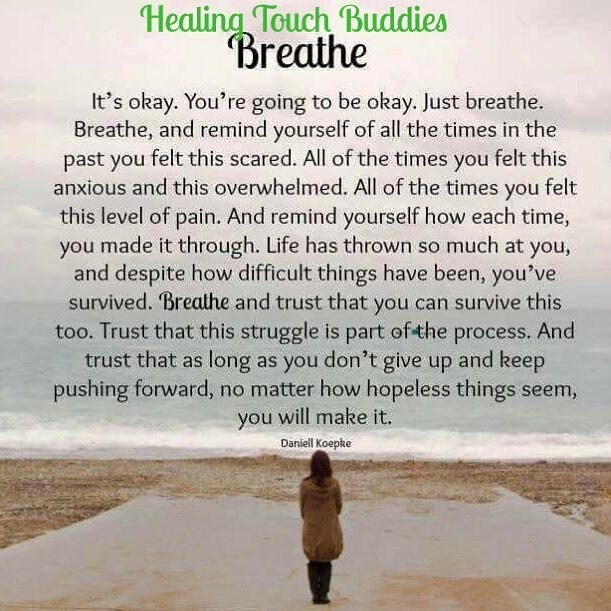 If you have a loved one facing cancer, gentle reminders to take quiet time for controlled, deliberate and mindful breathing can be one of the best support methods you can offer. Give them their space, give them their quiet time, ensure no disruptions, and then be present for them when they finish. Give them 2 minutes or 2 hours...whatever they need and want.